WINGATE – The 16th ranked Wingate Bulldogs (8-0, 5-0) rushed out to an early 21-0 1st quarter lead and never looked back, cruising to a 44-20 win over visiting Newberry (4-5, 2-3) on Saturday afternoon at Wingate's Irwin Belk Stadium. With the win, the Bulldogs clinched at least a share of the South Atlantic Conference title with a chance to win outright next weekend. Wingate got on the board quickly with a 1-yard score by Lawrence Pittman (Mallard Creek). Pittman's score was set up by a quick defensive three-and-out to start the game and a 58-yard pass play from sophomore quarterback James Whitaker to BJ Muckelvene (Cuthbertson). The defense stepped up again on the next Newberry drive as linebacker Zack Singleton (South Stokes) stepped in front of a pass near midfield and returned it 49 yards for the pick-six and a 14-0 Wingate lead less than five minutes into the game. Showing excellence in all parts of the game, the Wingate special teams picked up the third score of the game as BJ Muckelvene returned a Newberry punt 85 yards to the house. Muckelvene added two more touchdowns in the second half on receptions of 21 and 45 yards. Mucklevene's three receptions of the day netted 124 yards, leading the Wingate offense. 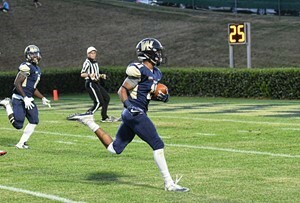 Wingate senior running back Lawrence Pittman finished the game with 148 yards on 26 carries. With his third quarter 24-yard touchdown run, Pittman now holds the school record for touchdowns in a career. Freddy McCollum (Southern Lee) was 5 of 6 on extra point tries and kicked a 21-yard field goal to close the scoring in the fourth quarter. "This was a great win for us against a very good team. I am proud of the way we battled from start to finish." Wingate hosts Limestone Saturday, Nov. 4 for Homecoming, Senior Day and Tailgating for the Troops. Kick-off is slated for 6 p.m. Newberry visits Catawba Saturday, Nov. 4 at 1:30 p.m.
Wingate Sports Information contributed to this story.